In retirement, former major leaguer Johnny Romano took up flying radio-controlled model airplanes near his retirement home in Florida. He liked to fly them high and far. There was a time, though, when those terms — high and far — also referred to his ability as a hard-hitting All-Star catcher for the Cleveland Indians and Chicago White Sox. Romano was pretty good defensively behind the plate and could handle a pitching staff with a deft hand. With a bat, though, he was even better. He liked to hit the baseball high and far, too. Romano, who was born on August 23, 1934, in Hoboken, New Jersey, always had the ability to hit with power. Nicknamed Honey by his uncle, he had the ideal physique for a catcher, standing 5 feet 11 and weighing a stocky 205 pounds. Romano used his solid build to his advantage when it came to hitting. But according to Romano, his prowess at the plate was probably due more to genetics than anything. His father, John Sr., was a former semipro baseball player and a longshoreman in New Jersey. “I was a very good power hitter,” Romano said. “It was born in me. My father was a catcher. He used to play semipro. At the time, they wanted him to go professional. But back in those days, he was making more money playing semipro and working off the piers than he would be playing professional ball. As young John grew older, he also became a local baseball star in Hoboken, which is just over a square mile on most maps. Even though it’s a small community, Hoboken has produced a dozen major leaguers including Romano. Along with Hoboken natives Tom Carey, Bill Kunkel, Leo Kiely, and others, Romano was coached and tutored by Tony Calland, who played for 12 semipro teams from 1918 to 1935 and got into two exhibition games with Babe Ruth and Lou Gehrig in 1930. After his playing days ended, Calland coached for 37 years in New Jersey before retiring in 1972. “He helped me quite a bit,” Romano said. By the time he was 19, Romano was playing in the minor leagues after signing with the Chicago White Sox organization. The two Chicago scouts responsible for signing Romano to a contract were Dutch Deutsch and Ed Holly. It was kind of by accident that Romano ended up in the White Sox organization. “I always thought I was always going to be a bonus baby with the Brooklyn Dodgers,” Romano said. That’s because he used to work out with the Dodgers at Ebbets Field by invitation of coach Clyde Sukeforth, a former major-league catcher, coach, scout, and manager who is best known for scouting and helping sign Jackie Robinson. After his days with Brooklyn, Sukeforth also played a part in signing Roberto Clemente to a contract with the Pittsburgh Pirates. Sukeforth, who died in 2000 at the age of 98, was a great boost to Romano’s career. He would encourage Romano and his older brother to take batting practice during pregame warm-ups and was a proverbial “mother hen” to the two Jersey boys. “I used to work out some with the Dodgers starting when I was about 15,” Romano said. But it was the White Sox, not the Dodgers, who wound up signing Romano. He moved through the Sox system quickly. Making his debut in 1954, Romano batted .355 with six home runs and 29 RBIs in 27 games for Dubuque (Iowa) in the Class-D Mississippi-Ohio Valley League. Promoted to Waterloo (Iowa) in the Class-B Three-I League in 1955, he hit .321, leading the league with 108 runs scored and 124 RBIs in only 118 games. His 38 homers that year set a league record. In ’56, Romano hit .284 in 33 games for Memphis in the Southern League and .241 in 81 games for Vancouver in the Pacific Coast League. By 1957, Romano was playing for Chicago’s Triple-A affiliate at Indianapolis in the American Association. He had another solid year at the plate, hitting .272 with 15 homers and 62 RBIs. But his defensive work still needed some polish. Romano became more of a complete player after the White Sox sent former major-league catcher Walker Cooper to manage Indianapolis in ’58. Cooper had caught 18 seasons in the National League, most notably for the St. Louis Cardinals and New York Giants, for whom he hit .305 with 35 homers and 122 RBIs in 1947. With Cooper as his skipper in 1958, Romano continued to carry a big stick as he hit .291 with 25 home runs, 29 doubles, and 89 RBIs. As expected, his catching abilities improved dramatically. Cooper’s help that year enabled Romano to punch his ticket to the majors. Romano played four games for Chicago in late September of ’58, and he performed admirably as a rookie off the bench for manager Al Lopez during the 1959 season. As backup to Sherm Lollar, Johnny hit .294 with five home runs and 25 RBIs in 53 games for the White Sox, who won their first American League pennant in 40 years with a 94-60 record. Romano particularly excelled as a pinch-hitter in ’59, going 8-for-13. The White Sox already had Gold Glove-winning catcher Sherm Lollar firmly established behind the plate. Romano, though, got Lopez to let him play a little as a rookie in ’59 by letting his bat do the talking. Romano was involved in a rare play while catching for the ’59 White Sox. In major-league history, there have been only 13 triple plays in which all the outs were tag outs. On September 27, the last day of the season, in the bottom of the third at Detroit’s Briggs Stadium, the Tigers had Tom Morgan on third base and Harvey Kuenn on first. Gail Harris grounded to pitcher Bob Shaw, who threw to third baseman Bubba Phillips. Phillips tagged Morgan in a rundown between third and home for the first out, and then raced across the infield and tagged Harris, who had rounded first base during the rundown. Phillips then fired the ball to Romano to prevent Kuenn from scoring. Kuenn had to retreat to third, where shortstop Luis Aparicio slapped the tag on him. Heading into the 1960 season, the White Sox had a plethora of young talent and not enough room on the roster. In addition to Romano, first baseman Norm Cash, outfielder Johnny Callison, and catcher Earl Battey were all promising youngsters. Before the season started, all four players were traded. In 1960, Romano, playing regularly for the first time, hit .272 for the Tribe with 16 homers and 52 RBIs. In ’61, Romano was named to the American League’s All-Star team by hitting a career-high .299 with 21 homers, 29 doubles, and 80 RBIs. He ranked eighth in the AL in hitting and 10th in doubles. Romano’s on base-plus-slugging percentage (OPS) of .860 was the 10th highest in the AL. He had a 22-game hitting streak that year, a Cleveland team record for catchers until it was broken by Ray Fosse with 23 games in 1970. Sandy Alomar Jr. now has the club mark for catchers with a 30-game streak in 1997. In 1963, Romano battled injuries and hit just .216 with 10 homers. He broke his hand when he was hit with a pitch against the Baltimore Orioles during the first game of a doubleheader on May 26. At the time of the injury, Romano was hitting .269. He was on the shelf until July 2. The Indians evidently figured that a one-handed Romano was a lot better than no Romano at all. They valued his knowledge and his handling of the many promising young pitchers Cleveland had during Romano’s tenure with the team. Sam McDowell was 18 when he broke in with the Indians in 1961 and eventually ended up with 2,453 strikeouts in his 15-year career. Tommy John debuted with Cleveland in ’63 when he was 20. He ended up winning 288 games in 26 major-league seasons. Both benefited from Romano’s experience early in their careers. Romano rebounded from his fractured hand by hitting .241 with 19 homers in 106 games in 1964. The Indians, though, traded Romano (along with Tommy John and outfielder Tommie Agee) back to the White Sox on January 20, 1965, as part of a three-team deal that also involved the Kansas City Athletics and returned Rocky Colavito to the Indians. In 1965, Romano hit .242 with 18 round-trippers for Chicago and followed that with a .231 average and 15 homers in ’66. The White Sox traded Romano with minor leaguer Lee White to the St. Louis Cardinals on December 14, 1966, for outfielder Walt “No Neck” Williams and pitcher Don Dennis. 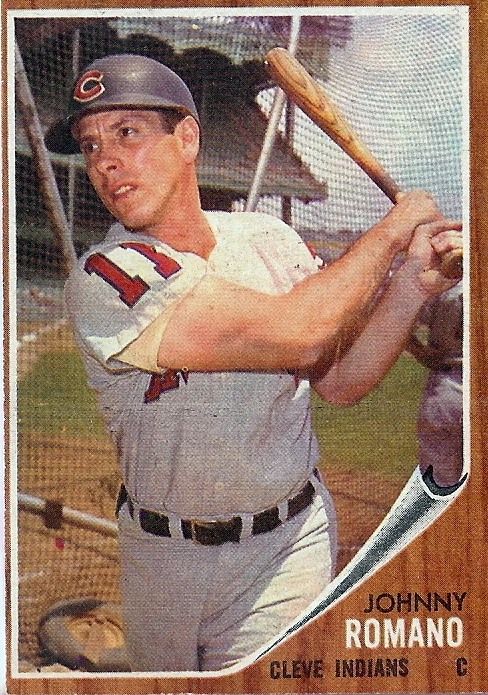 In 1967, Romano closed out his 10-year major-league career by hitting .121 for the Cards, who released him after they defeated the Boston Red Sox in a seven–game World Series (Romano did not make the Cardinals’ World Series roster). For his career, Romano hit .255 with 129 home runs, 417 RBIs, 355 runs scored, and 112 doubles in 905 games. Romano and his wife, Irene, were married on November 11, 1956. The union produced three sons: John Richard (born June 6, 1960); Allen (born October 6, 1962); and Robert (born Sept. 23, 1969). The Romanos have six grandsons and one granddaughter. John Romano passed away at his home in Naples on February 24, 2019. He was survived by Irene and his sons. Palmer, Pete, and Gary Gillette. The 2005 ESPN Baseball Encyclopedia (New York: Sterling Publishing Co., 2005). Johnny Romano telephone interviews on May 10, 2006, and February 3, 2008. Irene Romano telephone interview, August 18, 2008. 1 John Romano telephone interview, May 10, 2006. All quotations from John Romano are from this 2006 interview unless otherwise noted. 2 Irene Romano telephone interview, August 18, 2008. 3 John Romano telephone interview, February 3, 2008.